This is the best way to eat Kale, by far! It maintains all of its nutritional value because it is a salad (hence not cooked) but is delicious and easy to eat as it is marinated. Kale has gained fame as a source of calcium that is absorbed by our bodies about twice as well as the calcium from dairy products. Kale, contains sulforaphane, a chemical believed to have potent anti-cancer properties.Kale is also a source of indole-3-carbinol, a chemical which boosts DNA repair in cells and appears to block the growth of cancer cells. Hemp seeds are another awesome ingredient in this salad. It is rich in omega 3, 6, and 9. Protein is the other major component of hemp seeds, second only to soy yet easier to digest than soy.Hemp seed is one of those “super foods” that you should go out of your way to eat! What we love: Delicious combination of sweet and salty and a recipe that actually makes the kale tender to eat.This salad will last 2-3 days in the fridge so long as you don’t add the tomato and avocado until you are ready to serve. Something else to love — it doesn’t have any dressing! The 2 tablespoons of sesame oil and the juices from the oranges combine to make it fabulous! What we love less: This is a great-all-round salad. Massage the salt and sesame oil into the kale leaves in a bowl. Let it sit, covered, for 2 hours. Once you are ready to serve slice the large tomato into thin strips in the salad and garnish with avocado. You can also add slices of strawberry, mango and pineapple for a more tropical, fruity blend! 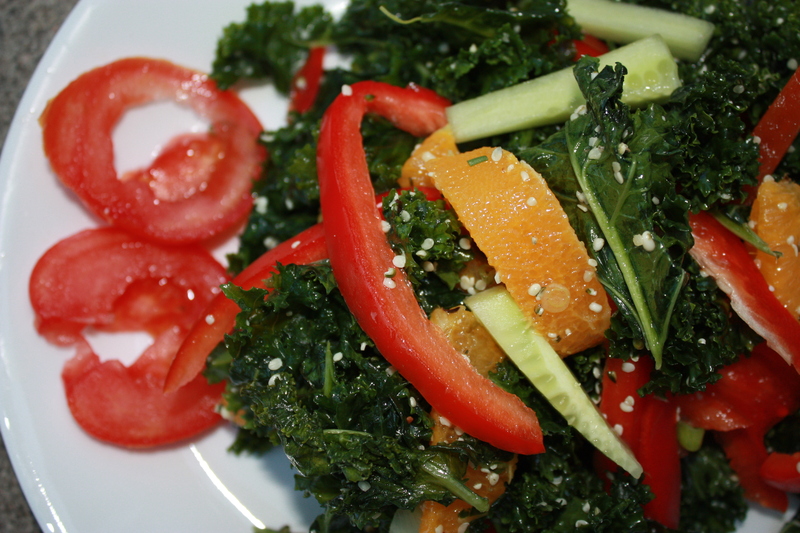 This entry was posted in Salad and tagged health, kale, orange, salad, sesame, vegan, vegetarian. Bookmark the permalink. This looks great. I love kale, and sneak it into all of my kids food. They are clueless! So healthy — your kids will thank you!